With FESTOPAS® your shop counter will become a force for sales. Whet your customers’ appetite by putting together a mouth-watering food display – letting the goods take the lead role in creating a powerful sales stage that makes your business quite an experience to shop in. To do so your goods need the right presentation tools: Meat and cut meats, fresh and smoked fish, salads, cheese and delicates-sen: FESTOPAS® shows off all your wares in the best light – appetizing and extremely tempting. Loss of merchandise, especially where meat is concerned, -becomes a thing of the past. In contrast to trays made from metal, pure melamine does not cause discolouration on the -side of the meat that touches the tray. Meat juice discharge and associated weight-loss are reduced. Pure melamine keeps your goods fresh under ideal hygiene conditions. FESTOPAS® is in particularly high demand in the best-selling convenience sector: Pre-cooked food and tasty delicacies such as wraps and ready-made meals presented in a first-class display drastically increase customer interest and subsequently sales, as well. 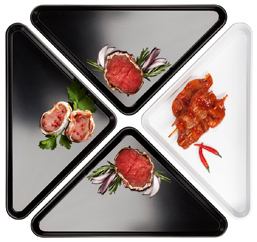 Almost all dishes can be covered and stacked to save storage space by select-ing the corresponding FESTOPAS® ids of the same length x width dimension, for example the dishes of Art.-No. 68/0 and 68/1 can be covered with plates of Art.-No. 77/0. Dishes that still contain food after opening hours are simply closed using the lid, making containers easy to stack in the fridge and keeping the food clean and fresh without having to refill it into different containers.